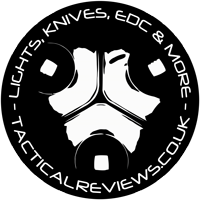 There are many designs floating about for a DIY Lumen measuring device, but I decided to try something I have not seen posted elsewhere and take it back to basics. For the light integrator I wanted to use a sphere because it has no flat surfaces, so should help avoid any direct reflections skewing the results. A hollow polystyrene sphere (30cm) appeared the simplest choice, but actually allows a lot of light to pass through it. To counteract the high level of light transmission, the inside was given several coats of white matt finish acrylic paint. The bright white paint is opaque and reflects well, and the matt finish helps scatter the light and make the overall light level inside nice and even. I thought about using my lux meter, but ruled this out for two reasons. Firstly the sensor head is quite large and secondly, the lux meter does not allow me to log the results. Finally I settled for a very simple circuit based around a photodiode. The photodiode was selected as it is specifically tuned to visible light (in fact it has an IR filter built in), and has a response very similar to the human eye. The reason for this is that I am measuring the output of a light which is supposed to emit visible light, so if the light happens to output a lot of IR or UV light, this is not much use, so becomes wasted output. After working through various possible circuit designs from those that could measure sub-lumen outputs, but quickly overload, to the design I am using, which should respond relatively linearly up to many thousands of lumens. Having cut an aperture into which the light will be shone, a small section was flattened just inside the sphere. The circuit board was fixed with hot melt glue such that no direct light, even from a full flood light, would fall directly on the sensor. The output from the circuit can be measured with a multimeter in the mV range, and having a logging multimeter then enables me to check output over time. Not having any ‘standard’ light source, I decided the best way to attempt some sort of calibration of the sphere was to use a selection of lights from reputable manufacturers including Fenix, Nitecore, FOURSEVENS and Zebralight. Each of the lights was set to all available output levels, with a reading taken for each, and all the results collated with the manufacturers specified outputs. There was a general trend with a few results falling either side. I decided to use an average of all the results giving me a factor to use with the mV reading to convert it to measure lumens. Choosing four lights with small enough heads to fit into the sphere opening all at the same time, I first measure the output of each of them individually. Then starting with one, then another, then another and then the last, I noted the readings for their combined output. The result was that the cumulative output at each stage, exactly matched the sum of the individual light’s readings. Due to the limitations of the aperture in the sphere, I was only able to perform this test up to 1500lm. As this portion of the response was completely linear, hopefully higher ranges will also maintain this linearity of response. Comparing extreme throwers and full flood lights has so far indicated that the sphere’s integrating function is working very well and does not favour any beam profile. Having had a few pre-production samples for review with unspecified outputs, the sphere has enabled me to provide estimated outputs for the levels, in lumens. 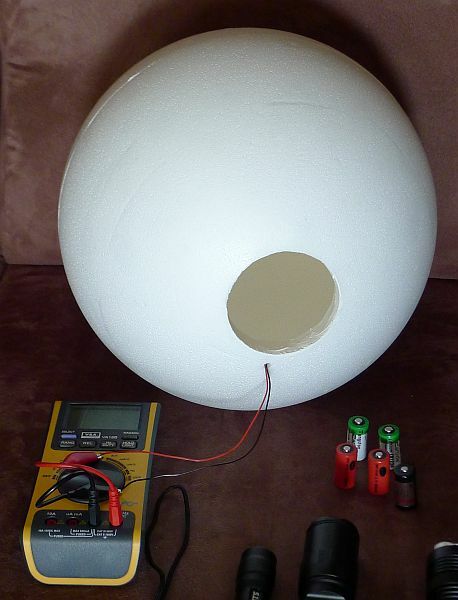 Following a review of a 2000lm light which came out at 1891lm using this sphere, I decided to measure a 65W HID. This was done with some concern as the heat and UV emitted by this light might have damaged the polystyrene and sensor. The peak reading was 3560lm, which seems very reasonable as HID’s emit a lot of IR and UV, and it was an ebay HID. The sphere did start to smell a bit hot, but came out unscathed and after checking a lower output light again, found no damage had been sustained.